When you open the solid wood front door of a Stamm house, you feel safe and at home. 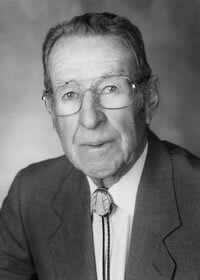 It is said that to this day, no one has contributed more to the concept of home and affordable housing as visionary Santa Fe builder Allen Stamm. Mr. Stamm began building his high-quality, affordable homes in 1939 after serving in WWII. Knowing the suffering of the war and the Great Depression, Mr. Stamm "understood that hard-working but poor people needed decent homes in which to live and raise their families." Stamm shaped several of Santa Fe's most distinctive neighborhoods and redefined home design and building. Stamm homes feature hardwood floors, vigas, kiva fireplaces, nichos and other traditional touches completed with superlative workmanship. An early Stamm had two bedrooms, one bath, living room, kitchen, one-car garage, a walled back yard and an open front yard. Mr. Stamm hired women consultants to design the kitchens and did not fence the front yard because he wanted neighbors to get to know one another. He designed places for Christmas trees and highchairs and built garages easily converted to a new bedroom. As families grew, garages were converted to bedrooms, rooms were added on, and in some cases, second stories were added. The sizes and floor plans vary. Some homes are as small as 815 square feet and are as charming as they can be while others have undergone renovations and add-ons. The best known Stamm neighborhoods are Casa Solana (west of St. Francis Drive and north of W. Alameda Street). Casa Alegre (on both sides of Osage Avenue, sandwiched between Agua Fria Street and Cerrillos Road), and Casa Linda (off of Cerrillos Road at Monterey Drive). Unfortunately, you can no longer buy a Stamm home for $3,800 with a $300 down payment at $40 per month, but by today's standards, Stamm homes are still modestly priced and a top-notch investment. A Stamm lets you still buy a single family home in town with a yard and mature trees for a reasonable price. Resale prices range from $300,000 to over $500,000 and they go fast! To learn more about Allen Stamm, please click here to view his"Santa Fe Living Treasures" page.